We are pleased to announce the first version of the KumuluzEE AMQP project. This version provides support for the RabbitMQ message broker. KumuluzEE AMQP supports sending and receiving messages with a few simple annotations. Broker configuration can be defined with the configuration framework, which makes it fairly simple. The first version of KumuluzEE OpenTracing has been released. It implements the MicroProfile OpenTracing specification 1.2.1. Initial version of KumuluzEE OpenTracing brings full power of distributed tracing to your new/existing microservices. From automatic tracing of incoming JAX-RS requests to tracing function calls with annotations, the extensions has all the necessary features. We are pleased to announce the release of KumuluzEE Rest Client 1.1.0. This release supports asynchronous requests and client builder interceptors. KumuluzEE Rest Client 1.1.0 implements the MicroProfile Rest Client 1.1 specification. Asynchronous requests are now possible with the updated Rest Client. To make an request asynchronous, change the return type of the interface method to CompletionStage. We’re happy to announce the first release of KumuluzEE Rest Client. This release implements the MicroProfile Rest Client 1.0.1 specification. KumuluzEE MicroProfile Rest Client supports generation of rest clients from simple definitions. APIs are defined using interfaces and well-known JAX-RS annotations. Generated rest clients provide a type-safe way to invoke defined APIs and support a wide variety of providers which allow fine-grained but natural configuration at various stages of requests. We are pleased to announce the release of KumuluzEE Fault Tolerance 1.1.3. This release brings the update to the 1.1.3 version of the MicroProfile Fault Tolerance specification and Java 9+ support. KumuluzEE Fault Tolerance is now integrated with MicroProfile Metrics and includes instrumentation of all Fault Tolerance patterns. This enables developers and operations team to monitor critical points of the system, detect and locate faults as soon as possible and make adjustments to the parameters of the fault tolerance patterns if needed. We’re releasing the KumuluzEE MicroProfile Config 1.3.0. This version implements the MicroProfile Config specification 1.3, which introduces a better implicit converter and removes redundant converters. This release also brings full support for Java 9+. We are happy to announce the release of KumuluzEE Fault Tolerance 1.0.1. This release brings improved compatibility with the MicroProfile specification. KumuluzEE Fault Tolerance is now integrated with MicroProfile Config, which enables greater flexibility when configuring fault tolerance mechanisms. Check out the MicroProfile specification to learn about various ways to influence fault tolerance behavior directly from the configuration files (or other configuration sources). We have also added another implementation of Circuit Breaker alongside existing Hystrix implementation. The main feature of our implementation is the support for the successThreshold parameter and full compatibility with the MicroProfile specification. We’re announcing the release of the KumuluzEE JWT Auth 1.0.1. This release adds the MP-JWKS support for KumuluzEE JWT Auth. This allows the library to use JWKS as a source of verification keys. Please note that this release is not yet compliant with the MicroProfile JWT Auth 1.1 specification. A new version will be available in the near future. We’re announcing the release of the KumuluzEE Testing 1.1.0. The KumuluzEE Arquillian Container Adapter has been updated and delivers improved dependency handling, better exception reporting, support for Uber JAR package deployment and more. After a few months of development and testing, KumuluzEE GraphQL is now officially released. You can now use GraphQL in your microservices. Extension is designed to be as user-friendly as possible; you can create your first GraphQL endpoint with as little as two annotations in the code! Wide JDK support (from Java 8-11). Get started with the extension by checking out samples at GitHub. Source code and documentation can be found here. We’re happy to announce the KumuluzEE Event Streaming extension v1.0.0 for the KumuluzEE framework. The extension enables developers to easily integrate their microservices with the Apache Kafka platform, produce and consume events, and build stream processors. All the features can be easily implemented with provided annotations. We are happy to announce first stable release of KumuluzEE-gRPC extension. This extension provides an easy way to include gRPC communication protocol in your existing KumuluzEE microservices. Define API (using Protobufs), extend generated classes, provide configuration and you are good to go! gRPC client is also supported, basic configuration is provided automatically to you by extension. For more advanced scenarios, you should consider using grpc-java library directly. This release supports JWT token based authentication and client-server verification using asymetric crypthography. JDK8 is the highest version currently supported. JDK9+ will be included in the near future. We are happy to announce the final release of the KumuluzEE 3.0.0. The new major release brings full support for Java 9+ and support for Java EE 8 with some new components and a bunch of updated components. All implementations of the listed components have been updated to the latest Java EE component versions, so you’re free to use any of them. New release of KumuluzEE Swagger has arrived. With version 1.2.0 we are bringing new features and enhancements. Added support for OAuth authentication to SwaggerUI. Added support for hostname and base path overriding by setting kumuluzee.swagger.base-url. We are happy to announce the third prerelease of the KumuluzEE 3.0.0 Beta. The v3.0.0-beta.3 prerelease of KumuluzEE framework further improves on the v3.0.0-beta.2 prerelease. We have entered the second phase of KumuluzEE Beta testing. The v3.0.0-beta.2 prerelease of KumuluzEE framework continues to improve on the already stable v3.0.0-beta.1 prerelease. KumuluzEE Swagger 1.1.1 has arrived! We are announcing new version of the KumuluzEE Swagger extension - v1.1.1. Changes to the extension configuration. KumuluzEE OpenAPI 1.0.0 is released! The first version of the KumuluzEE OpenAPI extension is now available. KumuluzEE OpenAPI project allows you to document microservice APIs using OpenAPI v3 compliant annotations. The extension will automatically hook-up servlet that will serve your API specifications. Furthermore, the extension allows you to integrate Swagger-UI into your microservice that will visualize APIs documentation and allow you to interact with your API resources. We’re happy to announce the release of KumuluzEE Metrics 1.1.1. This release implements the MicroProfile Metrics 1.1.1 specification, which brings a new reusable flag, integration with KumuluzEE MicroProfile Config and some general improvements to the programmatic API. We’re announcing the KumuluzEE Config MicroProfile v1.2.1. This version implements the MicroProfile Config specification v1.2.1, which introduces array converters and common sense converters. We’re announcing the first release of the KumuluzEE Testing tools. The first release contains the KumuluzEE Arquillian Container Adapter, which brings the popular integration testing framework Arquillian to the KumuluzEE. We are announcing the release of libraries for Node.js platform @kumuluz/kumuluzee-config@1.0.0-snapshot and @kumuluz/kumuluzee-discovery@1.0.0-snapshot. We are happy to announce the support for widely used CXF implementation of Java API for XML Web Services (JAX-WS). The release 3.0.0 of KumuluzEE microservice framework will bring the support for SOAP web services with context dependency injection (CDI). We have released the first snapshot of KumuluzEE GraphQL extension. GraphQL is a data query language developed internally at Facebook in 2012 before being publicly released in 2015. It provides an alternative to REST and ad-hoc webservice architectures. It allows clients to define the structure of the data required, and exactly the same structure of the data is returned from the server. It is a strongly typed runtime which allows clients to dictate what data is needed. This avoids both the problems of over-fetching as well as under-fetching of data. KumuluzEE GraphQL enables you to easily create your GraphQL endpoint or convert an exsisting REST endpoint with the use of annotations. Learn more about GraphQL or get started with a basic sample. Pre-release version of Ethereum extension for KumuluzEE framework is now available. Extension provides support for interacting with smart contracts on the ethereum network using web3j. You can write your own smart contracts and deploy them on the network right from IDE. KumuluzEE Swagger 1.0.0 release is here! We’re happy to announce the initial version of the KumuluzEE Swagger extenion v1.0.0 for the KumuluzEE framework. KumuluzEE Swagger (OpenAPI 2.0) extension provides support for documenting APIs using Swagger/OpenAPI v2 compliant annotations. Extension automatically hooks-up servlet that exposes API specification on endpoint /api-specs//swagger.[json|yaml]. Extension also provides SwaggerUI which is added to your project to visualize API documentation and allow API consumers to interact with API endpoints. KumuluzEE CORS version 1.0.3 is now released. The new version now works together with other extensions. Integration testing with the KumuluzEE framework has just become a lot easier with the KumuluzEE Arquillian Container Adapter. The newly developed adapter brings support for the popular Arquillian framework. KumuluzEE Arquillian Container Adapter starts the KumuluzEE server before running the tests, which enables the tests to interact with the environment closely resembling the one in production. KumuluzEE Metrics, an implementation of the Eclipse MicroProfile Metrics API, has been updated to support the Eclipse MicroProfile Metrics 1.1. New version adds a flag reusable to the Metadata object, which primarily means, that a metric can be injected multiple times in multiple places. Acquisition of global tags was changed from environment variable MP_METRICS_TAGS to MicroProfile Config property with the same name. This means, that global tags can additionally be supplied via the MicroProfile Config extension. KumuluzEE MicroProfile Config, an implementation of the Eclipse MicroProfile Config API, has been updated to support the Eclipse MicroProfile Config 1.2. New version adds the support for the array converter that converts configuration values into arrays of types with available converters or into types Array, List or Set. Common sense converter, used where there is no corresponding type of converters provided for a given class, and a Class converter are also supported. We’re announcing the availability of KumuluzEE Config 1.1.0, an update to the configuration management extension, which extends basic configuration framework with etcd and Consul configuration sources. KumuluzEE Swagger (OpenAPI 2.0) extension provides support for documenting APIs using Swagger/OpenAPI v2 compliant annotations. Extension automatically hooks-up servlet that exposes API specification on endpoint /api-specs/<jax-rs application-base-path>/swagger.[json|yaml]. Extension also provides SwaggerUI which is added to your project to visualize API documentation and allow API consumers to interact with API endpoints. More details about Swagger Specification. KumuluzEE OpenAPI extension allows you to document microservice APIs using OpenAPI v3 compliant annotations. Extension will automatically hook-up servlet that will serve your API specifications on endpoint /api-specs/<jax-rs application-base-path>/openapi.[json|yaml]. Furthermore, extensions allows you to integrate Swagger-UI into your microservice that will visualize APIs documentation and allow you to interact with your APIs resources. More details: OpenAPI v3 Specification. Learn how to deploy and run KumuluzEE microservices on Kubernetes by reading the following DZone article: Java EE Microservices on Kubernetes With KumuluzEE. We’re happy to announce the initial version of the KumuluzEE Health extension v1.0.0 for the KumuluzEE framework. KumuluzEE Reactive is an extension for developing reactive microservices for the KumuluzEE microservice framework. KumuluzEE Reactive provides integration with Vert.x distributed event bus, integration with Vert.x service discovery, easy-to-use annotations for developing microservices that listen to or produce messages on the Vert.x distributed event bus and a service discovery bridge for importing and exporting services from Vert.x Service Discovery to KumuluzEE Discovery (for Consul and etcd). We are announcing the release of KumuluzEE Reactive extension for developing reactive microservices and integration with reactive streams (Vert.x and similar). Implementing cloud-native applications by following microservice architecture brings quite a few challenges. Because of the distributed nature, microservices have to be able to deal with unexpected failures caused by node crashes, deadlocks, connectivity issues etc. To build truly resilient systems, failures have to be tackled with different mechanisms such as circuit breakers, retries/timeouts and health checks, at the same time in order to cover all the aspects of the failures. KumuluzEE Health extension health check set has been expanded with an EtcdHealthCheck. KumuluzEE Health extension health check set has been expanded with a HttpHealthCheck. Today Kubernetes is one of the most commonly used runtime platforms for the containerized applications. Providing automatic binpacking, horizontal scaling, automated rollouts and rollbacks, self-healing, service discovery, load balancing and other services out of the box, Kubernetes is a platform that suits microservices down to the ground. However, equally as important as the utilities provided by the runtime environment is the ability of microservice framework to exploit provided utilities. In this three-part blog, we will demonstrate how KumuluzEE microservice framework is able to make use of Kubernetes for optimal execution of the microservices. You can use our online pom generator to quicly generate pom files with selected profiles or individual Maven dependencies. When kumuluzee-openapi dependency is included in the project, you can start documenting your REST API using Swagger-Core Annotations. KumuluzEE is adding support for OpenAPI v3! KumuluzEE OpenAPI extension provides OpenAPI v3 compliant annotations that you can use to provide OpenAPI v3 specification for your APIs. When kumuluzee-swagger dependnecy is included in the project, you can start documenting your REST API using Swagger-Core Annotations. KumuluzEE Swagger extension is released! You can now provide Swagger/OpenAPI v2 specification for your APIs simply by including KumuluzEE Swagger dependency and annotating your REST API. KumuluzEE Swagger will expose Swagger specification for your API when your microservice is started. We have published an interesting article to the Eclipse newsletter, in which we talk about the importance of service discovery in the microservice architecture. We also present some advanced scenarios of service discovery and how to handle them with the KumuluzEE Discovery extension. We published a tutorial on developing a cloud-native Java EE microservice application, using KumuluzEE microservice framework and KumuluzEE extensions. In this tutorial we develop a sample application for managing customers and their orders. The application consists of two microservices; one for managing customer entities and one for managing order entities. We demonstrate important cloud-native concepts and functionalities that are essential in microservice architecture, such as dynamic configuration (with config server), service discovery, fault tolerance, centralized logging, performance metrics collection, and security mechanisms. Browser script perspective: Allowing cross-domain requests, which are subject to tihter controls on the types of data that is exchanged. Cookies, for instance, are blocked unless specifically requested by the XHR author and allowed by the cross-domain web-service. Web service perspective: By utilising the origin URL reported by the browser the target cross-domain web service can determine, based on its origin policy, wheather to allow or deny the request. CORS filter can be configured in two ways: using @CrossOrigin annotation or using servlet filter by providing cors-filter configuration section in prefered config source (i.e. config.yaml, etcd etc.). We are announcing the initial version of KumuluzEE Health extension. KumuluzEE Health is a health check extension for the KumuluzEE microservice framework. We are announcing the release of KumuluzEE CORS extension providing Cross-Origin Resource Sharing support to Java web applications. KumuluzEE Security is a security extension for the KumuluzEE microservice framework. It provides support for OpenID authentication through standard Java EE security annotations for roles. It is specifically targeted towards securing REST services. Roles are mapped to the selected OpenID provider. KumuluzEE Security has been designed to work with different OpenID providers. Currently only Keycloak is supported. Contributions for other OpenID providers are welcome. KumuluzEE Discovery is a service discovery extension for the KumuluzEE microservice framework. It provides support for service registration, service discovery and client side load balancing. KumuluzEE Discovery provides full support for microservices packed as Docker containers. It also provides full support for executing microservices in clusters and cloud-native platforms with full support for Kubernetes. KumuluzEE Discovery has been designed to support modularity with pluggable service discovery frameworks. Currently, etcd and Consul are supported. In the future, other discovery frameworks will be supported too (contributions are welcome). We are announcing the release of KumuluzEE Security extension which provides support for OpenID authentication through standard Java EE security annotations. More details at KumuluzEE Security. KumuluzEE Fault Tolerance is a fault tolerance extension for the KumuluzEE microservice framework. It provides support for fault tolerance and latency tolerance with circuit breaker, bulkhead, timeout, retry and fallback patterns. KumuluzEE Fault Tolerance supports basic fault tolerance configuration using annotations. Additionally, configuring via KumuluzEE Config is supported. Dependency calls are wrapped and executed using Hystrix, a latency and fault tolerance library. We’re happy to announce the initial version of the KumuluzEE REST extension v1.1.0 for the KumuluzEE framework. We’re happy to announce the initial version of the KumuluzEE Discovery extension v1.0.0 for the KumuluzEE framework. We are announcing the release of KumuluzEE Logs extension version 1.3.0. This version marks an important milestone, since the extension was restructured and Java Util Logging implementation was added to the existing Log4J2 implementation. Beside the restructuring and another implementation the logging extension can now be configured by KumuluzEE Config. More details at KumuluzEE Logs. We are announcing the release of KumuluzEE Fault Tolerance extension which provides support for fault tolerance patterns. Circuit breaker, retry, bulkhead, timeout and fallback patterns are available. We are partially supporting Microprofile Fault Tolerance and are planning to fully support the specification with the final release of API. More details at KumuluzEE Fault Tolerance. Monitoring of APIs is one of the essential functionalities of API Management tools. API Gateways collect and record different metrics of API invocations. Usage - shows number of API calls on the level of API, API endpoint and client application. 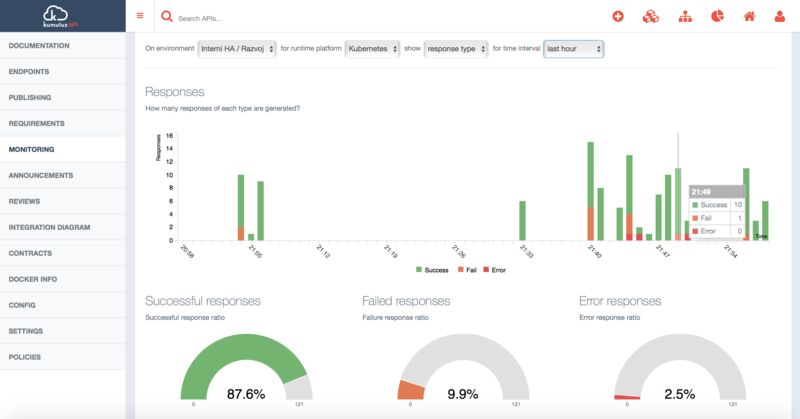 Response type - shows the statistic of API calls based on the response type (success, fail and error). Statistics are shown for the level of API, API endpoint and client application. Duration - shows the average response type on the level of API, API endpoints and client applications. Availability - shows the API availability monitoring status which is performed periodically by KumuluzAPI to detect API unavailability (it also includes automatic alerts to inform API owner). All metrics can be viewed for the following time periods: 1 hour, 24 hours, 7 days, 30 days and 90 days. We are announcing the release of KumuluzEE Streaming extension which provides easy-to-use annotations for developing microservices that produce or consume event streams. This article explores the way the microservices can be used together with Java EE using KumuluzEE. It expands on the benefits and drawbacks compared to the monolithic architecture that’s popular in Java EE. It shows how to quickly and simply develop two microservices with standard Java EE using KumuluzEE. You can find the examples produced in this article on GitHub under the name microservice-simple. This is an updated version of the original article from 2015. The industry standard approach for deploying Java EE applications is packing all components into single EAR/WAR archive and deploying the archive on an application server. Although this approach has several advantages, particularly from the ease-of-development perspective, it leads to monolithic architecture, makes applications difficult to maintain, and - particularly important - makes such applications more difficult and sometimes impossible to scale to meet today’s real world demands, especially in PaaS (cloud) environments. Microservice architecture addresses these shortcomings by decomposing an application into a set of microservices. Each microservice has well-defined functionalities and an interface to communicate with other microservices (such as REST, WSDL, or if needed even RMI). Most often, microservices are stateless. Makes it much more efficient to scale applications in PaaS and Docker-like environments. We are announcing the release of KumuluzEE Logs extension providing a lightweight open-source logging framework specifically designed for logging microservices. This article explores the way the microservice architecture can be used together with Java EE using the new KumuluzEE framework. It expands on the benefits and drawbacks compared to the monolithic architecture that’s popular in Java EE. It shows how to quickly and simply develop two microservices with standard Java EE using KumuluzEE. You can find the examples produced in this article on GitHub under the name microservice-simple.